Single stage. 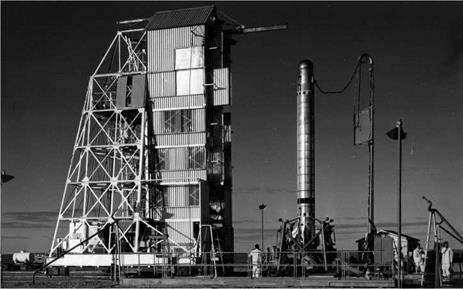 Launched 1 May 1962 at 22:43. Apogee 494 miles. BK15 was a re-entry physics experiment but limited by the availability of ground instrumentation on the range at the time, i. e. the ‘Gaslight’ project equipment and not the more sophisticated ‘Dazzle’ project equipment. 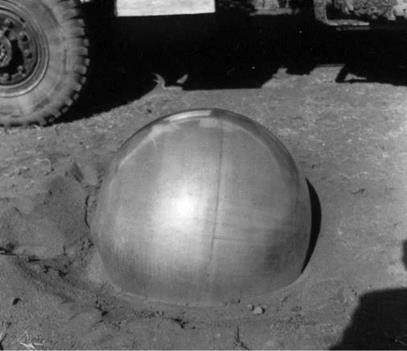 A single-stage vehicle was fitted with a separating uninstrumented 36-inch diameter copper sphere (the first pure metal head used). The object was to achieve re-entry of the sphere in advance of and well separated from the main body, to provide spatial resolution for ground instruments. This was to be done by turning the vehicle over in the yaw plane after engine burn-out, then separating and pushing the head vertically downwards away from the body when it had turned through 180o. Figure 95. BK15 prior to launch. A sabot containing thrust units was used to push the head away; the sabot itself was to have remained attached to the body by a lanyard. Subsidiary upper atmosphere experiments were also carried out and further data obtained on Gamma 201 engine performance and propellant usage. It was also intended to test for the first time an ‘automatic pilot’ in the ground guidance system. A head re-entry velocity of 11,600 ft/second was achieved at 200,000 ft. The vehicle turnover and head separation devices worked, but the timing of the latter was incorrect; the head was separated before the vehicle had turned through 180o. The lanyard failed to hold the sabot to the body and the sabot therefore accompanied the head. The re-entry of the head was not recorded by any ground instrument nor was it seen by any observer. This in itself is a significant result since it confirms the prediction that, because of the absence of ablation products and other contaminants in its wake, the re-entry into the atmosphere of a pure copper head should be a target difficult to detect by optical means. The sphere was recovered and, as expected, there was no heat discolouration of the surface; the maximum surface temperature did not exceed 350 °C during re-entry. Figure 96. The BK15 copper sphere after re-entry.